Heckmondwike boxer Cory O'Regan with Mark and Martin Bateson. Heckmondwike boxer Cory O’Regan will move into the professional ranks when he fights at the Elland Road Pavilion on a show in December. O’Regan became the first boxer to hold an English amateur title belt in 2016 and then went on to reach the senior Elite National Championships in the same year. At 22-years-old, O’Regan believes the time is right to move into the paid ranks under the guidance of Leeds promoters and trainers Mark and Martin Bateson. O’Regan gave the Elite Nationals one final crack and reached the semi-finals when he narrowly lost to GB boxer Dalton Smith. O’Regan took up boxing at the age of 10 years old, initially joining Keith Tate’s run Cleckheaton Boxing Academy. He had his first junior bout at the age of 11, which proved the start of an excellent amateur career. 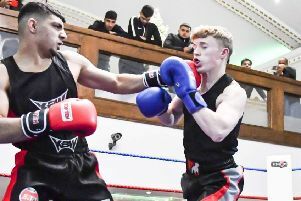 O’Regan went on to win around eight regional heats of the national championships and having moved into the senior ranks, he claimed the English title, while being trained by former Dewsbury professional Mally McIver out of the Bradford College Gym. He also won a gold medal in the Tri Nations Series and was part of the England set up for a couple of years. O’Regan said: “I had considered going pro before as Mark and Martin (Bateson) have a good stable of pros. “I have been training with them for quite a while now but we decided to give the National Elite Championships a final crack. “I lost to the eventual winner, GB boxer Dalton Smith, in a closely fought semi-final. “He just edged the fight and went on to win the final more convincingly. O’Regan will make his professional debut on a show being billed as ‘Christmas Beatings’ at Elland Road on December 2, the day after his 23rd birthday. O’Regan is set to be busy in 2019 with a number of fights planned, with sponsorship and ticket details available by calling him on 07511 412248.